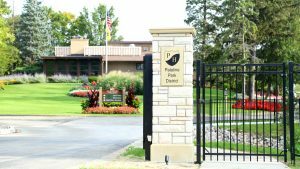 ​As summer draws to a close, so do a variety of exciting improvements to Palatine Park District’s Palatine Hills Golf Course​. From the entrance culvert project back in March to the completion of the new stone pillar entrance gate completed in August, the course has gone through a season of changes in an effort to enhance the presentation and quality of the course. The Short Course Practice Area consists of three green complexes that each offer golfers the opportunity to practice their short game up to 75 yards and closer. Private use of a green complex, golf balls, shag bag, and range finder is $7 for 45 minutes and only $10 to share a complex with a friend. Fall rates at Palatine Hills are now in effect that apply to both residents and non-residents. Play 18 holes Monday through Friday with a cart for $39 and on weekends for only $44. Those looking to play 9 holes can do so with a cart for $24 Monday through Friday and $29 on weekends. On Saturday, October 7, the annual Fall Scramble​ will be held at the course with a shotgun start at 9:00am. Registration deadline is October 1. Call the Pro Shop at 847.359.4020 or visit palatinehills.org​ for more details. For more information about the enhancement projects at Palatine Hill Golf Course, contact Head Golf Professional Dan Hotchkin at 847.496.6310 or at dhotchkin@palatineparks.org​.